Halloween is almost here! This month, in honor of that fun night, we’re shining our spotlight on a product that will make Halloween decoration a little easier: Orange Brilliant Brand LED Rope Lighting. 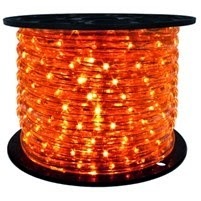 This rope lighting features a vibrant glow perfect for accenting a home, and its bright orange hue makes it absolutely perfect for decorating for Halloween. This lighting has horizontal bulb placement, which gives off uniform, omnidirectional light and isn’t as bright as vertically placed bulbs. It’s also compatible with 2-wire Rope Light Controllers, which will allow you to create lighting effects. Just choose the effect you want — dimmed, faded or flashing — and purchase the controller that will help you achieve that effect. How do you plan to decorate for Halloween this year? Let us know in the comments!